What I like most about this software is essentially what it offers as an alternative to other communication methods with vendors. Overall, having a live chat with a vendor is at times much easier and more convenient than making a phone call. While waiting for my other party to answer me back, I can be doing work on my PC and not have to worry about waiting on hold in line on a phone call. The communication through this software is fast and easy and does not allow for much wasted time, connections are made fast and easy. What I like least are the aesthetics. While it is very easy and straightforward to use, for many users it may bring on the nostalgia of the late 90s chat room or messengers. Simply updating its GUI would help with this outdated messenger vibe. While the aesthetics do not affect performance, from my end they have an impact on user perception of the software. This I feel takes away from the experience of the use of this software tool which in turn lowers its quality. I like the simplicity of the Livechat interface ,and this is a major factor while I adopted the program as my startups customer chat solution. It is affordable, which is very cheap when compared with the enormous benefits we have gotten from this program over the last one year. I like the Livechat customer support department. he support team have continuously served my startup very well. We get responses to our queries instantly via chat messages and the support team also forwards us periodic write-ups guiding us on newer ways we can use Livechat ,to grow our business. I am provided with daily and periodic stats and metrics which easen the process of measuring the performance of my customer care team. Livechat is just the real deal. However I am not overly impressed with its mobile app,I will like to see a better improved mobile app. which will remove the need of always having to access Livechat from a desktop or laptop computer to make major changes or customization.We should be able to do everything from the mobile app. Unlimited customization – Livechat provides helpdesk teams with unlimited ability to customize their Livechat experience from chat window themes , to introducing social media buttons ,editing engagement graphics or removing the White label Livechat icon .Enabling teams to customize their Livechat experience. Dedicated support team – Livechat probably has amongst the best support teams for a software program . They are reachable across every hour of the day and promptly address any constraint we encounter while using Livechat. Analytical power – Livechat provides my team with analytical data detailing web visitor interaction with our website. These analytical data helps the help desk team improve the quality of our game ,while also aiding the product design team to effectively customize our website for maximized sales conversion. Livechat is the best help desk solution money can buy.No complaints whatsoever ,and I have been a user for over two years. Definitely, it is a very effective tool for communication between the client and the business. Its quick and simple configuration is an added value .. you can measure almost that in saw the stories of the user and agent, there is with the reports section that shows the number of days you have had chats, chat satisfaction scores, number in queue and the results of the surveys. I like Livechat’s Facebook integration. Courtesy of this ,our customers are now able to communicate with my company’s helpdesk team via our Facebook page. Since we began using this feature early in the year ,we have seen a steady increase in the number of customer chats we respond to on a daily basis. I will like to see Livechat improve on the Livechat mobile app. My personal opinion is that this app. is way too basic for customer service ,as we are only able to communicate via chat using the Livechat app. For every other thing we need to do on Livechat ,we must do it via the Livechat website. Founded back in 2002, LiveChat was one of the first providers of an online live chat solution. With humble roots as a “garage startup,” LiveChat’s first product offered a very basic, simple application to introduce a new channel of communication. Today, LiveChat offers one of the most feature packed real-time live chat software solution, with years of experience and innovation under their belt. Based in Poland, LiveChat offers service globally and even has a location within the United States. 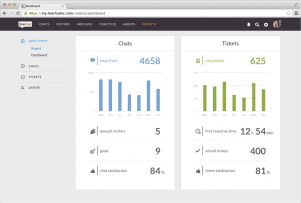 LiveChat now serves over 24,000 businesses, and offers the tools to not only introduce a new channel of communication on your website, or in your app, but also the tools to analyze overall support efficiency and customer satisfaction. LiveChat’s mission is to not only provide organizations with a robust business platform, but also to share the knowledge and experience gained over the years building their own business, as well as provide a personal touch to online communication. As one of the original live chat software providers, LiveChat knows a thing or two about developing a robust business platform. The provider has grown their simple messaging app into an entire platform that enables organizations to open up an entirely new channel of communication with their clients and prospects. 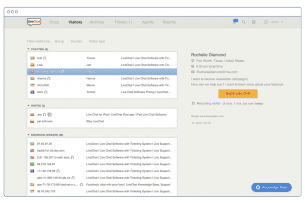 But not only does LiveChat enable a new efficient form of support, the platform also provides the tools necessary to track and quantify every single interaction your business has. With advanced reporting and analytics tools, your business can better understand what is working, what isn’t working, and what exactly needs to be improved. LiveChat delivers a product that they believe will change the definition of Customer Service Experience. Overall, the solution is easily one of the most feature packed offerings on the market. While pricing might not be the most competitive, you absolutely get your money’s worth in terms of a fully functional, customizable and robust platform. For example, even within the most basic Started plan at just $16 per agent, per month, your business gains unlimited agent accounts, 60-day chat history, and even basic customization options like default chat window translations and different themes to choose from. In fact, even upgrading to the Teams plan introduces an unlimited chat history, full chat customization, basic reporting tools, multiple branding support and even agent groups. 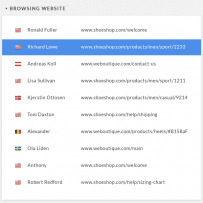 The feature list only grows from there, and easily stands out among the competitors. For example, while the most popular Business plan might cost as much as some other provider’s top-of-the-line offering, features include advanced reporting like first time response and average time response, staffing prediction, and a work scheduler. What’s also unique about LiveChat is that your business is only charged based on the number of agents logged in per month. This means that if your department is flexible, and the number of agents changes based on demand or season, pricing will rise and drop accordingly, so you do not have to pay for agent seats your business isn’t using. In fact, the feature list even in LiveChat’s starter plan rivals the mid-level offerings of some competitors. For only $16 per agent, your business gains access to canned responses, pre-chat and post-chat surveys, agent ratings, visitor details, multiple website support, visitor tracking, smart chat routing, and even a ticketing system. Overall, LiveChat offers an impressive list of features and functionality across all of their plans. Depending on the size of your business, each plan will provide the necessary tools to handle support requests through chat with ease. 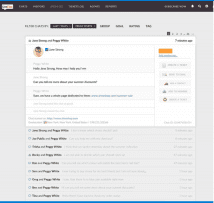 What Do You Think of LiveChat?